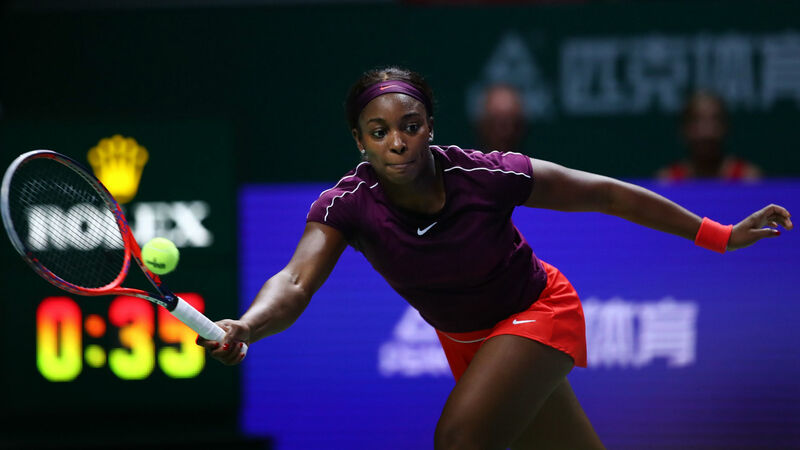 Sloane Stephens became the second WTA Finals debutant to reach the last four on Friday, eliminating top seed Angelique Kerber to ensure the four lowest-ranked players in the field will contest the semifinals. Stephens made it three wins out of three in her Singapore debut to seal top spot in the Red Group, setting up a semifinal against Karolina Pliskova with a clinical 6-3, 6-3 victory. The 2017 U.S. Open champion weathered an early Kerber storm, saving seven break points in the first set and converting all three break-point opportunities of her own, before securing a fifth consecutive win over the German without dropping a set. Stephens kept her composure as the aggressive world No. 2 racked up 38 unforced errors and bowed out to end her season, a lack of ruthlessness dashing her hopes of winning the title for the first time. [email protected] gets the win and books her place in the @WTAFinalsSG semifinal! Kiki Bertens, another WTA Finals debutant, qualified when runner-up when Naomi Osaka retired due to injury earlier in the day and will face Elina Svitolina on Saturday, with all four of the top seeds out of the tournament. Kerber bombarded Stephens with a barrage of thunderous forehands in an aggressive start, but the resolute American saved two break points in her first service game and another three in her second as the Wimbledon champion failed to seize the initiative. Stephens rubbed salt in the wounds by grasping her first break-point opportunity with an overhead volley and continued to frustrate the three-time Grand Slam champion, holding to lead 4-2 after fending off another two break points. The fifth seed’s backhand was proving to be a potent weapon as she opened up a 5-2 advantage and took the set with a third break in a row after Kerber finally managed a break, which came a little too late. It was Stephens applying the pressure early in the second set as the two continued to trade punches from the baseline, going 3-1 up after winning a seventh break point in a marathon game when Kerber made a mess of a drop shot. Kerber clenched her fist after breaking straight back when the world No. 6 thudded a backhand into the net after being worked from side to side, but the tiring 30-year-old had her head down after Stephens broke again to lead 5-3. The steely Stephens served out the match at love, continuing her dominance of Kerber with an impressive combination of stoic defense and counter-punching.